Albertus Magnus 1250? Schroeder published two methods of preparing elemental arsenic in 1649. Arsenic has a valence of -3, 0, +3, or +5. The elemental solid primarily occurs in two modifications, though other allotropes are reported. Yellow arsenic has a specific gravity of 1.97, while gray or metallic arsenic has a specific gravity of 5.73. Gray arsenic is the usual stable form, with a melting point of 817°C (28 atm) and sublimation point at 613°C. Gray arsenic is a very brittle semi-metallic solid. It is steel-gray in color, crystalline, tarnishes readily in air, and is rapidly oxidized to arsenous oxide (As2O3) upon heating (arsenous oxide exudes the odor of garlic). Arsenic and its compounds are poisonous. Arsenic is used as a doping agent in solid-state devices. Gallium arsenide is used in lasers which convert electricity into coherent light. Arsenic is used pyrotechny, hardening and improving the sphericity of shot, and in bronzing. Arsenic compounds are used as insecticides and in other poisons. Arsenic is found in its native state, in realgar and orpiment as its sulfides, as arsenides and sulfaresenides of heavy metals, as arsenates, and as its oxide. The most common mineral is Mispickel or arsenopyrite (FeSAs), which can be heated to sublime arsenic, leaving ferrous sulfide. 1090 K at 35.8 atmospheres (triple point of arsenic). At normal pressure, arsenic has no melting point. Under normal pressure, solid arsenic sublimes into a gas at 887 K.
There are 30 known isotopes of arsenic ranging from As-63 to As-92. Arsenic has one stable isotope: As-75. Arsenic sulfide and arsenic oxide has been known since ancient times. Albertus Magnus discovered these compounds had a common metallic component in the Thirteenth Century. Arsenic's name comes from the Latin arsenicum and Greek arsenikon referring to yellow orpiment. Yellow orpiment was the most common source of arsenic for alchemists and is now known to be arsenic sulfide (As2S3). Gray arsenic is the shiny metal allotrope of arsenic. It is the most common allotrope and conducts electricity. Yellow arsenic is a poor conductor of electricity and is soft and waxy. 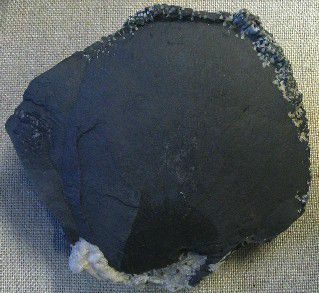 Black arsenic is a poor conductor of electricity and is brittle with a glassy appearance. When arsenic is heated in air, the fumes smell like garlic. Compounds containing arsenic in the -3 oxidation state are called arsenides. Compounds containing arsenic in the +3 oxidation state are called arsenites. Compounds containing arsenic in the +5 oxidation state are called arsenates. Victorian era ladies would consume a mixture of arsenic, vinegar and chalk to lighten their complexions. Arsenic was known for many centuries as the 'King of Poisons'. Arsenic has an abundance of 1.8 mg/kg (parts per million) in the Earth's crust.